Pollution problems are a leading cause of unrest as China undergoes rapid economic development, and citizens have become more outspoken against environmentally risky projects in their backyards. Villagers have rioted over the dumping of toxic chemicals into streams on farmland; the poisoning of streams by mines; the seizing of land for poison-producing factories; the unwillingness of local officials to tackle environmental problems; and inability of the legal system to address their grievances. Protests often bring at least a temporary halt to such projects, particularly when they involve the urban middle class. But local officials who are under pressure to deliver economic growth often restart them once the outrage dies down. Residents have become increasingly outspoken about pollution in their backyards. According to Reuters: Environmental “protests, which are tolerated more than those driven by political concerns, pose a conundrum for the authorities which want to maintain social stability but also present an image of listening to the needs of ordinary people. China sees around 180,000 demonstrations a year on a wide range of issues, including some against proposed chemical plants in what analysts have identified as a rising trend of environmentally-motivated "not in my backyard" protests. Some think that environmental issues may mobilize the masses to seek more rights, freedom and democracy as was somewhat the case in East Europe when Communism collapsed there. In 2005, there were 51,000 pollution-related protests and disputes, an increase of 30 percent from the previous year. In addition to this Beijing and local governments have been flooded with hundreds of thousands of environmental complaints. But while protests in middle-class cities like Dalian and Xiamen have succeeded, the government rarely gives in and demonstrations in rural villages don't often work. Protests are often localized and ineffectual. They often end with the government giving in to some token demand that means little in addressing bigger, more serious problems. In July 2012, Chinese officials cancelled an industrial waste pipeline project after anti-pollution demonstrators occupied a government office in eastern China, destroying computers and overturning cars. In the same month, thousands took to the streets in Sichuan province's Shifang town to protest against a $1.6 billion copper refinery they feared would poison their families. The city government swiftly called off the project. Demonstrators in Tangshan, protesting a tire-recycling factories that produces toxic clouds upwind from an elementary school, hung banners and mounted speakers on pedicabs demanding the rubber factory comply with national pollution laws. Local officials threatened to takes away the jobs and pensions of the protestors and throw them in jail. The protesters collected money and took their issue to Beijing, where Communist party superiors pressured the officials in Tangshan to close the plant. In Hunan, villagers organized to protest the fouling of the Qingshui River from molybdenum mining operation in hills along the river. So much waste from the mines entered the river the water turned black, discoloring clothes washed in it and fouling rice paddies that relied on the river for irrigation water. In May 2005, residents of the village of Xiachaoshui raided the 200 mining sites and destroyed mining equipment with hand tools and bricks. What was remarkable about this protest is that local Communist leader failed to intervene, meaning they tacitly supported the protests. A few weeks earlier in the village of Guideng, villagers mounted a similar operation against a water-polluting vanadium refinery. There authorities joined in the raids and said they would damage more facilities and resign en masse unless Beijing did something to solve the problem. 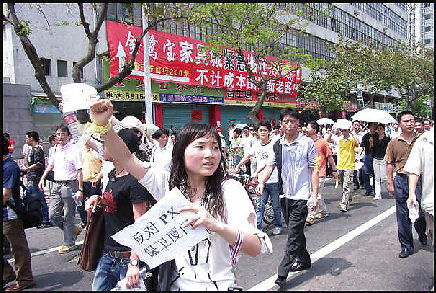 In May 2008, 200 people protested the opening of an ethylene plant and oil refinery in the northen outskirts of Chengdu. In March 2009, about 2,000 villagers blocked a road and disrupted construction of a steel mill in the town of Jiangnan near Chongqing. Some of the protestors clashed with police. In July 2009, about 1,000 people clashed with police in central Hunan after it was revealed that children there had high levels of lead in their blood as a result of being exposed to pollution from the Wugan manganese smelting plant. Enraged parents blocked a road and overturned a police car as they demanded free medical tests and treatments fo their children. Anger had been building for some time. Farm plots in the area lie unharvested as the soil has been poisoned to a depth of 20 centimeters. The well water has been deemed undrinkable. Hunan Province is an important producer of heavy metals and one of the most polluted areas in China. In Shuangqiao village in Hunan Province, where more three people have died and 500 have been sickened been heavy metals such as cadium, protesters took their grievances to the Internet and drew attention their problem---resulting in the Xianghe chemical factory being shut down. There have been a number of protests and riots in relatively wealthy Zhejiang Province over the affects of pollution on villagers. The industrial zone in the province that surrounds Shanghai is notorious for its polluting factories. In July 2005, three days of rioting broke out in Xinchang in Zhejiang Province when 15,000 people gathered to protest pollution produced by the Jinxing pharmaceutical factory and demanded that the factory be moved. The protesters, undeterred by tear gas, fought with police, overturned police cars and threw stones. The riot were finally brought under control when dozens of buses arrived with 3,000 paramilitary police. The protests in Xinchang were sparked by the explosion of a ruptured vessel containing deadly chemicals that killied one worker and contaminated a river that provides irrigation water and drinking water for farmers downstream. The farmers had tried to complain directly to the company that runs the factory. When they showed up at a scheduled meeting, instead of meeting with company representatives they were beaten up by company goons. Later a mob returned and stormed the factory. The farmers in Xinchang had been angry about the drug plant for some time. They say chemicals from the plant have caused the yields of their fields to decline and made the residents weak and nauseous. In July 2005, thousands of villagers from the village of Jianxia in Mesishan County in Zhejiang Province took control of a battery factory they said was poisoning their children. A thousand workers were held hostage. In April 2005, thousands of villagers rioted in Mangkantou village in Danyang city in Zhejiang Province over toxic chemicals pumped into streams and on farmland by local pesticides and chemicals plants. Two elderly women were killed, villagers said, when they were run over by police vehicles. Fifty police were injured in riots following the deaths of the two women. Ten police cars were overturned and rocks were hurled at police holed up in a high school. The incident began at 4:30am one night when 3,000 police descended on a camp set outside the Zhuxi Industrial Park in Huaxui (Huashui) outside of Donyang, 120 miles south of Hangzhou, where about 200 elderly women were keeping a 24 hour vigil to protest waste produced by 13 chemical factories at the industrial park. Villagers had anticipated the police raid. Fireworks were fired off when the police arrived and 20,000 villagers from villages near he industrial park arrived and surrounded the police. The sight of the police beating up the old women stirred the crowd into a frenzy and they began pelting the police with rocks. After a short time the police lines collapsed and the police made a run for it. There were reports that six policemen were killed and a chief had tendons in arms and legs severed. Later the police made a counter attack, using a wedge maneuver to scatter the protesters and get the upper hand. Residents of the villages had been complaining for years about the Zhuxi Industrial Park producing foul-smelling chemicals that irritated their eyes, caused them to get sick, damaged their crops and seeped into their drinking and irrigation water. The chemicals were believed to be behind alarming increases in sickness, and babies stillborn or born with deformed limbs or learning disabilities. Villagers also complained that eating newly harvest rice made them sick to the stomachs and fumes closed the eyes of their children. The worst offender was a pesticide factory forced outside of Donyang City because of the foul odors it produced. In 2001, protestors broke into the factory and smashed some equipment. In March 2005, after years of getting nowhere with local officials, residents built a tent camp outside the industrial park to act as a blockade to the factories. In January 2006 in Zhejiang Province, three villagers were sentenced to five years in prison for their involvement in the protests. Their efforts were not in vain. In the spring of 2006, the last of 13 factories that produced the pollution was closed. Word spread and gave local people confidence that could achieve concrete results if they worked together to fight local authorities. The construction of a $1.6 billion chemical factory in Xiamen was halted after citizens there launched a successful text messaging campaign. Widely-distributed messages used inflammatory language comparing the chemicals produced at the plant to nuclear bomb material and warned of leukemia and birth defects. The messages reached more than 1 million cell phones and reached nearly all of Xiamen’s 1.5 million residents through cell phone, word of mouth or messages painted on building walls. Environmentalist posted the first messages on the Internet. In addition to raising fears about the chemicals themselves they also pointed out that the plant was built near a densely populated area and could damage the city’s tourism industry. As Internet sites were closed down, reports started showing up newspapers outside of Xiamen. Chinese authorities have technology to monitor cell phone messages and track their sources. They they tried to block message in Xiamen but when people send out messages to their friends and family members and they in turn send messages to more people information spreads in exponential fashion and is difficult to stop. Once the text message campaign gained momentum it took on a life of its own. 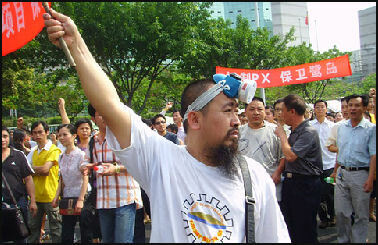 In early June 2007, demonstrations with 10,000 participants were held and Xiamen began getting nationwide coverage. Everyone was caught by surprise when the city announced construction of the chemical factory would be stopped. Many felt that was perhaps most significant about the protest was that people were not afraid to speak out even though they knew their messages could tracked. In December 2007, a public hearing on the plant was held and public opinion was almost unanimously against it. The plant has not been officially canceled but there are no plans to resume construction anytime soon. In March 2008, thousands of people took to the streets in several towns on the Gulei Peninsula in Dongshan County in southern Fujian Province to protest a proposal to build the $1.6 billion chemical plant originality slated to be built in Xiaman in their backyard. The Gulei Peninsula is about 80 kilometers from Xiamen. The protests turned violent, with police opening fire on the protesters with tear gas. A student told AP, “It was chaos.” He described police beating protesters with batons and shields and protesters throwing rocks at the police. About a dozen people were injured and 20 were arrested. The protests continued even after security forces with automatic weapons showed up. At first the residents of Donghsan County didn’t take much notice, but environmental activists began going door to door and handing out fliers. All of sudden people became concerned about the health threat and plummeting property values. Protesters staged a sit in to block traffic. By one estimate 10,000 people took part. A television announcement by the propaganda department that attempted to assure people that plant was safe and create jobs only made people more angry, Protests resumed the next day, and the police were called in. The protest reportedly turned violent after a woman got into an argument with a local official and the official slapped her. Protester then descended on a police station, demanding an apology and pelted police cars and motorcycles with rocks. “Mass incidents”--- or riots and protests--- sparked by environmental problems have been rising at a rate of 30 percent per year, according to China's environmental protection minister, Zhou Shengxian. Sharon Lafraniere and Michael Wines wrote in the New York Times, “By official estimates, 12,000 demonstrators marched in Dalian.” By other estimates, many more “protesters took part. “The mostly peaceful protest was one of the largest reported in nearly three years. It included the extraordinary scene of the city’s Communist Party secretary standing atop a car, pleading with demonstrators to go home and promising to close and move the $1.5 billion plant. Some responded by demanding a date. China’s embrace of wireless communications “first cellphone text messages, then Internet chat rooms and Twitterlike microblogs “has fueled such protests, allowing the disaffected to share grievances in a way never before possible. Dalian’s protesters flooded microblogs with photos, reposting them as fast as censors could delete them. “Once it was happening, I could follow everything through the pictures,” said one person in Dalian, Ma Lei, who considered joining the demonstration but was deterred by the police. Public reaction took time to build after the Fujia sea wall was breached. But the protest on Sunday showed clear signs of advance planning: demonstrators had large anti-Fujia banners, T-shirts, professionally printed placards and even face masks. Although the government said one group of demonstrators pelted police officers with plastic bottles of water and other objects, the protest appears to have been mostly peaceful. Some participants sang the national anthem. If the commitment by local leaders to move the two-year-old plant is carried out, the scale of the protesters’ victory would set a benchmark. The plant, a joint venture between a state-owned chemical company and a local real estate giant, is said to contribute more than $300 million in taxes to the local government each year. The Chinese media reported that officials were so eager to open it that they did not wait for environmental approval, another instance in a pattern of officials’ elevating economic development over health and safety that worries many Chinese. Dalian Protest in 2011 The protest in Dalian, Sharon Lafraniere and Michael Wines wrote in the New York Times, mirrored one in mid-2007, when thousands of demonstrators in Xiamen, in southeast China, forced local officials to abandon plans for a plant making the same chemical. But more broadly, scholars speak of a revolution of rising expectations in which Chinese citizens, growing more educated and wealthier, think their government should better protect their health, safety and other interests. “People are more aware of their rights, and they are demanding more rights and better protection of their interests,” said Yiyi Lu, an Asia scholar in Beijing with the research institute Chatham House. The government is more responsive, she said, but it is still “not reacting fast enough,” she said. “That is why there is growing discontent.” Some question whether China’s middle class is eager to assert itself. “The power of civil society is growing, but it is still very weak,” said Hu Xingdou, a professor of economics at Beijing Institute of Technology. Dalian’s compromise also points to a paradox that Communist Party leaders face as they begin “pressed by China’s top leaders “to pay more attention to local grievances. “You can find many examples of the government trying to better meet people’s demands,” said Ms. Lu, of Chatham House. “But when you improve your service, that creates more demand.” In particular, she said, the slow move toward more government transparency, in areas like official expenses, has encouraged citizen watchdogs to point out waste and abuse, further hurting trust in government. The factory, Zhejiang Jinko Solar Co. Ltd., was ordered to halt production lines emitting toxic gases or waste pending an investigation, the Haining government said in a statement. It ordered strict enforcement of environmental protection measures, but also "absolute efforts to ensure stability." Zhejiang Jinko Solar Co. is a subsidiary of a New York Stock Exchange-listed company, JinkoSolar Holding Co. According to the Haining city government, Zhejiang Jinko Solar's chairman, Li Xianhua, met with village representatives earlier in the month, but the villagers were dissatisfied with the company's response. More than 500 people gathered outside the factory. Some charged into the factory compound, overturned eight company vehicles and destroyed its offices, the government said. 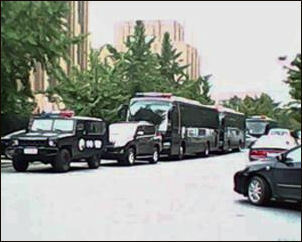 The next day demonstrators damaged four police vehicles. Video footage posted on the website of the city government's information office showed that the factory's windows were smashed and dozens of police officers were deployed to the site. Police detained 20 people for various alleged offenses, including causing public disorder, vandalism and theft. A 33-year-old man surnamed Sun, meanwhile, was detained for allegedly "spreading false information online" earlier this month about an increase in cancer cases in the nearby village of Hongxiao, the statement said. Elaine Kurtenbach of Associated Press wrote: “The protests reflect the dirty side of clean energy. While use of solar power can reduce the need for burning heavily polluting coal and other fossil fuels, the process of producing photovoltaic cells uses various chemicals and materials that can also be toxic.Zhejiang Jinko Solar's waste disposal has been failing pollution tests since April and despite being warned by authorities, the plant has not effectively controlled the pollution, the official Xinhua News Agency cited Chen Hongming, deputy head of Haining's environmental protection bureau, as saying. A 64-year-old Hongxiao villager surnamed Shi said not only does the factory discharge waste water into a river, it also spews dense smoke out of a dozen chimneys. "An elementary school and a kindergarten are located less than a kilometer (0.6 mile) from the plant. My house is only about 500 meters (550 yards) from the plant. Many fish died after the factory discharged waste into a small river," Shi said in a phone interview. "The villagers strongly request that this factory be moved to another area. I am very worried about the health of the younger generation," he said. That concession largely emptied the streets of demonstrators in the eastern port city, leaving only small groups of curious onlookers outside the Ningbo government offices, where a large police presence prevented crowds from forming. At the Zhenhai chemical industrial area, where a foul odor hung in the air, a handful of angry young men manned a makeshift barricade complaining that the local government had never followed through on a 10-year-old promise to pay a subsidy to local residents because of pollution.“It’s too smelly here,” says a young man wearing a white face mask over his nose and mouth. “We are here to protect people’s rights,” he says, declining to give his name. His complaint is only tangential to the main protest about the paraxylene plant, but it highlights how unhappiness over an environmental issue can easily spark broader grievances about issues like inequality of income. The mood in Ningbo highlights a big challenge facing China’s incoming leaders who are set to take power next month: Chinese are more and more willing to take their grievances to the street, particularly for pollution-related issues.“The time bomb has already been planted,” says Li Bo, environmental activist and board member of Friends of Nature, a Chinese advocacy group. The pollution that has accumulated during China’s decades of rapid growth is now extremely costly and difficult to manage, he says, and environmental concerns are rising. Police also lined the streets of Chengdu, the capital of southwest China's Sichuan province, after locals planned to demonstrate over a nearby chemical plant, residents said. "There were a lot of police outside government offices, public spaces and important crossroads in the city," one resident surnamed Liu said, adding that fliers posted around the city in recent days had called for a protest. "The fliers said the chemical plant has a big impact on people's health," he said, not wanting to give a full name for fear of official reprisals.The government responded with notices calling on people not to demonstrate, Liu said. Photos posted online showed ranks of police lining the city's streets. Local police on Saturday morning announced that they would be carrying out an earthquake protection drill, a claim dismissed by thousands of internet users. "It's about preventing the protest," one user of the popular social networking website Sina Weibo wrote in response to the police notice. "This is the most blatant lie in the history of Chengdu," added another. Locals online said that the protest did not take place. Schools and universities in the city were requested to hold extra classes on Saturday, in an apparent attempt to keep people from protesting, several online reports said. A "large number" of police were on the scene to "maintain order" and the area was cordoned off, captions said. Demonstrators engaged in shoving matches with police but there were no serious clashes, according to the website. Online Chinese text reports appeared to have been censored, with searches for "Kunming" and "PX" leading to messages reading: "The webpage you wanted to browse cannot be displayed for the time being." But Internet users overwhelmed China's Twitter-like weibo services with support for the protesters. "There is a riot in the mind of the people of Kunming who are strangled," wrote user "Director Wang Tingting". Another blogger, "Xi Xiaobudou", said: "Government and media, please do not lie -- we do not want the refinery to come to Kunming." Others called for an online petition to block the plant. "I'm the 213,670th citizen to disagree with building the refinery in Kunming... everybody please forward the post and add a number," said "Optimistic V". According to the official news agency Xinhua, Kunming's mayor Li Wenrong has promised: "The government will call off the project if most of our citizens say no to it."